The Church of the Nativity stands over the site of Jesus’ birth. Descend the steps into the Grotto of the Nativity and the Grotto of the Manger. 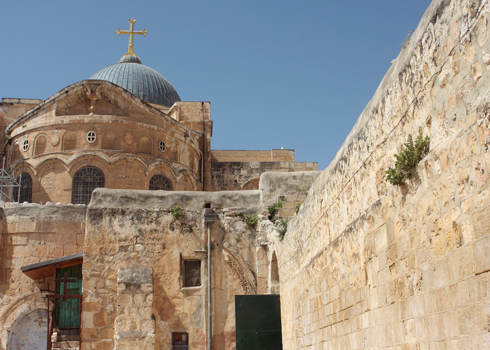 See the 14-point star that marks the precise spot where Jesus was born. The Last Supper is one of the most celebrated events in Jesus’ life. 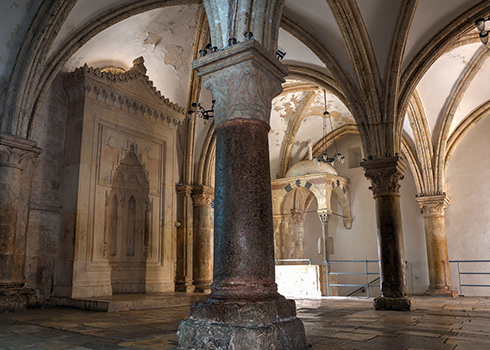 Go up Mount Zion and stand in the second-story room that commemorates the Upper Room where Jesus shared the Last Supper with the disciples. 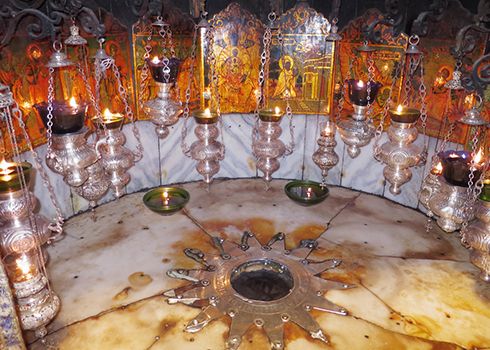 Within the walls of the Church of the Holy Sepulchre are two of the most sacred Christian sites. See the place where Jesus was crucified (Calvary or Golgotha), and the tomb where Jesus was laid after the Crucifixion. Depart the United States for your overnight flight(s) to Tel Aviv. Dinner and breakfast will be served on board. See the impressive archaeological remains of Caesarea. Then visit the Carmelite monastery Stella Maris and view the Bay of Acco. We will drive to Nazareth to visit Mary’s Well and the Church of St. Joseph. It was at Mary’s Well that the Angel Gabriel asked Mary to be the mother of the Son of God. We will end the day with dinner in Tiberias. Take a boat ride on the Sea of Galilee. Visit the Mount of Beatitudes where Jesus delivered his Sermon on the Mount. Close by is where Jesus fed the 5,000 with five loaves and two fish. Visit Magdala, the birthplace of Mary Magdalene, and then head to Capernaum to see the synagogue where Jesus taught. Enjoy dinner at your hotel. Celebrate Mass at Mount Tabor (the site of the Transfiguration), and spend time reflecting on this mystery. Then we will drive down the Jordan Valley to Jericho to see the Mount of Temptation. After visiting Jesus’ baptismal site in the Jordan River, we will head to Jerusalem for dinner and overnight. Visit a model of the Second Temple and then take a short drive to Ein Karem, the picturesque village where Mary visited her cousin Elizabeth. Here we will visit the Church of the Visitation. Later we will see the caves at Shepherds’ Field in Bethlehem and celebrate Mass in the Church of the Nativity, which marks the spot of Jesus’ birth. Dinner will be at the hotel. Take a morning drive down the Jordan Valley to Qumran, the site where the Dead Sea Scrolls were found. Take a dip in the Dead Sea before driving through the desert—the same desert where Jesus fasted for forty days. We will end our excursion with Mass in Bethany, the village where Jesus raised Lazarus from the dead. Enjoy dinner at your hotel. From the Mount of Olives, take the path Jesus walked to Jerusalem on Palm Sunday. Along the way, stop at the Church of the Pater Noster, walk through the Garden of Gethsemane, and spend time reflecting at the “Rock of Agony.” Celebrate Mass at the Church of St. Peter Gallicantu, and go up to Mount Zion to see the Upper Room. Dinner will be at the hotel. Beginning at the place where Pontius Pilate condemned Jesus to death, follow the Via Dolorosa (“Way of Grief”) to the Church of the Holy Sepulchre, which marks the site of both the Crucifixion and Jesus’ tomb. After celebrating Mass, visit the Church of St. Anne and the Pool of Bethesda. Explore the Old City of Jerusalem before going back to the hotel for dinner. If your flight is in the morning, you will be transported to the airport after breakfast. If your flight is in the late evening, you will have a late checkout from the hotel. Feel free to spend the morning at your own leisure. Meet back at the hotel in the afternoon and wish everyone “shalom” as you are transported to the airport for your flight(s) home. Sometimes we need to step back from life and take another look at who we are, what we are here for, what matters most, and what matters least. Without the distractions of your everyday life, the Holy Land provides a perfect opportunity to hear the voice of God and get to know Jesus in a whole new way. Imagine seeing the place where Jesus was born. Visiting Cana where Jesus performed his first miracle. Standing in the Upper Room. Praying in the Garden of Gethsemane. Walking the Way of the Cross. And seeing Jesus’ empty tomb. We will take you there.